If your SaaS startup were to trade in the public markets today, what would it be worth? The true answer is we don’t know, but we can approximate it by comparing it to the other publicly traded SaaS companies and benchmarking the business by its growth rate. 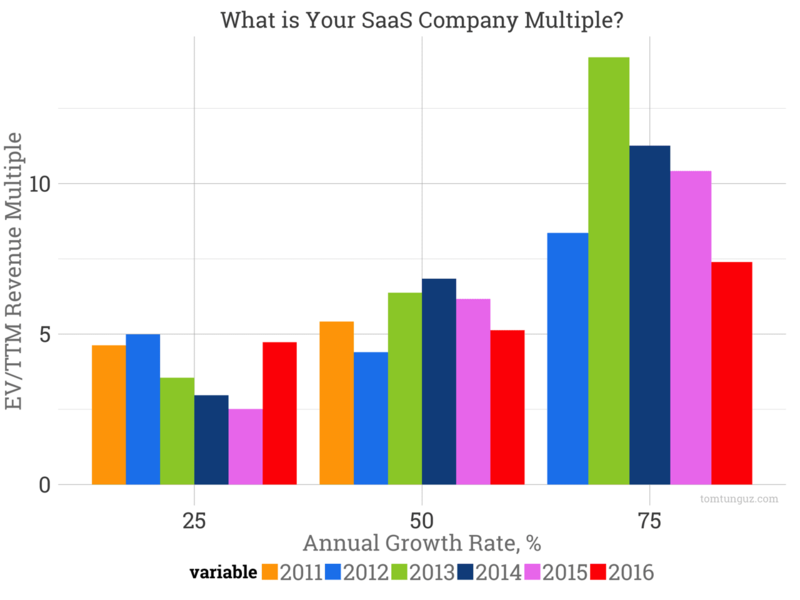 The chart above shows the median multiple of public SaaS companies by growth rate bucket, 25%-49%, 50%-74%, and 75%+ trailing twelve month revenue growth rate. Each color represents a different year. Let’s take the big green bar in the 75% bucket. 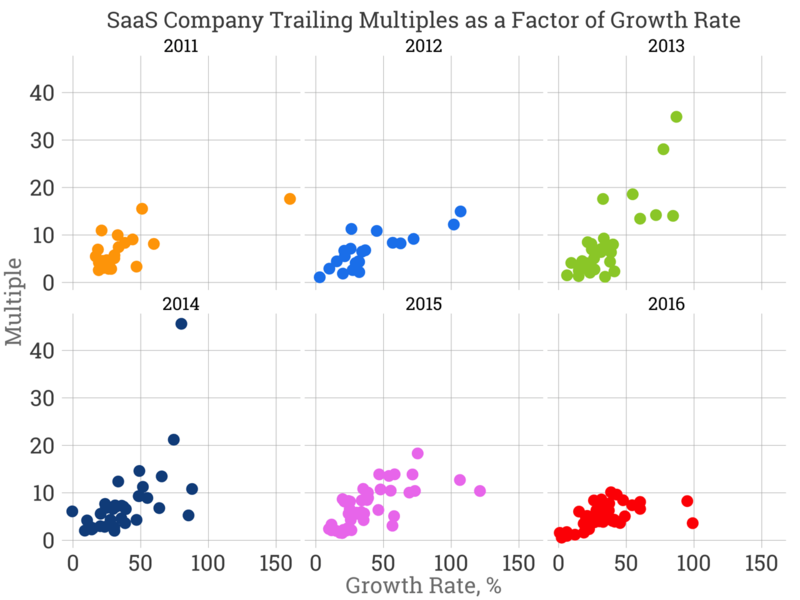 In 2013, the median SaaS company growing at 75%+ traded at a multiple of 14.2x. That’s very likely an all time record. The red bar indicates 2016 figures. Today, 75%+ growers trade at 7.4x. A company growing between 50-74% trades at 5.1x and 25%-49% at 4.7x today. These slower growing companies are fetching near historically high multiples, which suggest they aren’t being valued on growth alone, but likely net income profitability and cash flow. Again, this is an approximation. If we break out the data into individual data points, the change in the valuation enviroment becomes more apparent. In 2011, only a few companies traded at greater than 10x, even though one business was growing at more than 150% annually. 2012 was more of the same. 2013 on the other hand saw some astronomical multiples. 35x, 28x, 19x, 18x. 2014 recorded a 45x multiple. And since then, valuations have contracted with every single public business trading under 10x. These trends illustrate why 2016 is such a big year for enterprise M&A with about 30 $1B acquistions and take privates to date. In short, every company is trading at a discount relative to two or three years ago. To use a hyperbolic Warren Buffet aphorism, “Buy when there’s blood in the streets”. Though the fundamentals of business may not change substantially, the market’s perception of their value does change. This analysis provides a very basic proxy for estimating a SaaS company’s value. For startups, these values are likely lower than should be able to fetch in the private fundraising market for three reasons. First, capital supply in the venture fundraising market is at near-all time highs, which should increase startup prices. Second, startups tend to grow at rates much faster than these, so investors are willing to pay higher premiums. Third, many SaaS startups are valued on forward revenue as opposed to trailing revenue.